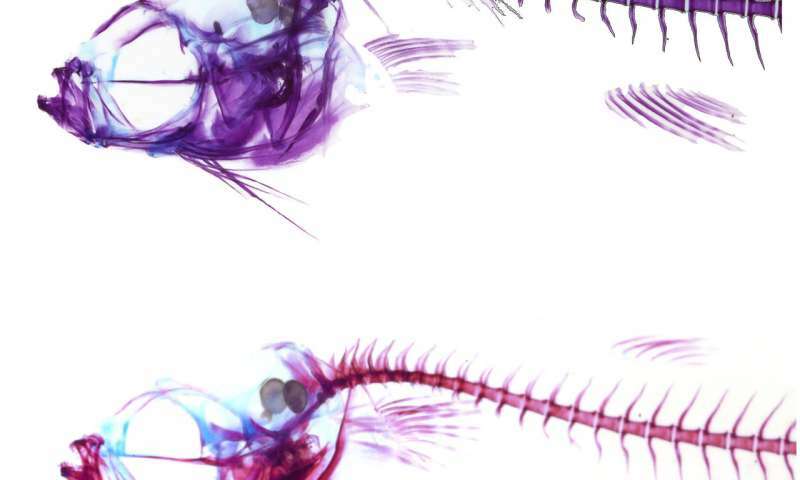 Two newborn guppies from Trinidad's Aripo river show clear differences in the maturity of their skeletons: The guppy from upstream (top), which spent longer in gestation, has more mature bone development as indicated by darker staining than the guppy from downstream, which was born earlier in maturity. Images not to scale. Credit: Dial et. al. Trinidadian guppy mamas can't swap links to maternity blogs or copies of pregnancy books, yet evolution has made them master strategists of childbearing nonetheless. A new study shows that guppies who live with so few predators that the main survival challenge is scrapping for limited food, gestate their young longer so they are born more mature and better able to compete for their meals. Moreover, the guppies extend their gestation during the exact period when their offspring are maturing their feeding capabilities most quickly, said lead author Terry Dial, a postdoctoral researcher in ecology and evolutionary biology at Brown University. That timing maximizes the benefit of delaying birth. The study speaks to a big question in evolutionary biology—the importance of how one is born for the course of life history—and provides an example of how evolution adapts key traits in the life history of organisms, Dial said. "A mother gets a lot of bang for her buck in terns of how much more of an organism she's putting out in the world by just increasing the amount of investment by a modest 10 or 15 percent," said Dial, whose research appears in Proceedings of the Royal Society B, a journal of the Royal Society. "The organism that's produced is nearly at the adult stage." The populations of guppies that inhabit the mountain rivers of Trinidad evolve in essentially two different environments. Lower down the mountainside, they face high predation (HP), and research has shown that guppy mothers in those situations play the odds by bearing more offspring more often. But those babies are born smaller and less mature. Higher up, above the waterfalls, there are many fewer predators, meaning that many more guppies compete for yummy algae and diatoms. In those low predation (LP) environments, moms produce fewer but larger offspring, and each egg has a little more yolk. Earlier this year in Scientific Reports, Dial and colleagues showed that the larger guppies in the LP environments are born more mature, with more bone and less cartilage in their skeletons, stronger muscles and more mobile mouths for scraping food off rocks. In the new study, Dial and co-authors answer the question of how the LP guppies end up being born more mature. There were three main possibilities, Dial said. Maybe LP guppies matured at a faster rate than HP guppies. Maybe LP guppies started maturing earlier than HP guppies. Or maybe the LP and HP guppies mature at the same time and at the same pace, but the LP guppies are just born later along that growth trajectory. To find out, they meticulously measured the bone and muscle development of samples of LP and HP guppies before, at and after birth. That approach allowed them to see any differences in when guppies started to mature, how long they gestated and how fast they matured. The measurements showed that HP and LP guppies started maturing at the same time and matured at the same pace. The same bones and muscles matured in the same order, too. What differed is that LP guppies were born about 10 percent later within a window of time in which all of the guppies did most of this musculoskeletal maturation. LP guppies are born with about 70 percent of their skeleton hardened as bone, for example, while HP guppies are born with about 20 percent of their skeletons as bone. It's as if evolution tells LP guppy mothers that if they hold on just a little bit longer during this critical phase, their kids will be born much more prepared to obtain food. By 30 days after birth, the HP and LP guppies are indistinguishable in their maturity, Dial found. Dial noted that for different organisms, maturity at birth could be the first trait that natural selection acts on, so it may be the trait that sets the tone for others including age at first reproduction and longevity. "In guppies, an offspring that's born larger tends to assume all of the suite of life history traits that go along with the low-predation phenotype," Dial said. "They first begin reproducing at older ages, they reproduce less often and they commit more energy into maintaining their own bodies. It's a critical stage and one that I think may inform the greater umbrella of life history traits in general." In the rivers of Trinidad, at least, perhaps it's all about how mama raised you.